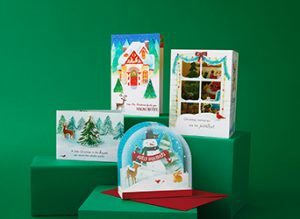 KANSAS CITY — Hallmark Cards Inc. is celebrating the holiday season with various launches of cards, gift bags and scented tissue paper. The company is introducing a new card line called Paper Wonder, featuring 20 designs in five formats. Each card unfolds, pops or expands to reveal a surprise inside. It will be the focus of Hallmark’s national marketing campaign during the holiday featuring digital ads, online video, streaming audio and a Hallmark Channel integration. In addition, Hallmark Signature is offering small strips of paper that are hand rolled, coiled, shaped and individually placed on each card to create a handmade piece of art in this four-card collection. Signature will showcase the art of paper craft with a two-card collection featuring cards that expand into three-dimensional paper ornaments. The card line has a number of dimensional designs for children that will inspire play, such as cards that feature traditional Christmas icons as removable finger puppets. New innovations in gift wrap this holiday season include Paper Wonder debuting dimensional gift wrap. The collection features gift bags, wrapping paper and trim. Also new this holiday are closed top gift bags and scented tissue paper. Box-top bags make it easy to wrap a gift with the ease of a gift bag, but provide the unwrapping experience of a box. Scented tissue paper in peppermint and pine is also on offer. Finally, Hallmark Signature is bringing a premium look to gift wrap with heavier paper, embellishments, gift boxes, metal handles and tissue paper with glittered edges.